As of August 2011, all refillable containers must have a tamper-evident device or a one way valve on each opening. Applicators should not break the tamper-evident device or valve unless specifically directed by the re-filler. Applicators and mixer/loaders need to empty their refillable container or shuttle as much as possible. Return refillable containers or shuttles to the dealer. 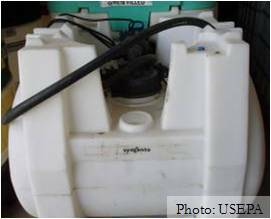 The dealer has the responsibility to refill the container with pesticide only or process for disposal. Do not reuse this container for any other purpose. Cleaning before refilling is the responsibility of the re-filler, not the applicator. Dealers have specific requirements for handling bulk pesticide repackaging to accommodate the return and refill of greater than 55 gallons liquid or 100 pounds dry material. If the same product is used for refilling, this activity can be done without cleaning the container if the container is returned with the intact tamper-evident devices and valves. If the dealer wishes to place a pesticide in a container which is different than the pesticide the container previously held, the dealer must thoroughly clean the container according to the written instructions of the registrant of the product being placed in the container. Once refilled, a new tamper resistant device must be installed. Both the dealer and the registrant of the pesticide being sold or distributed are liable for any cross-contamination or other adulteration which may occur.